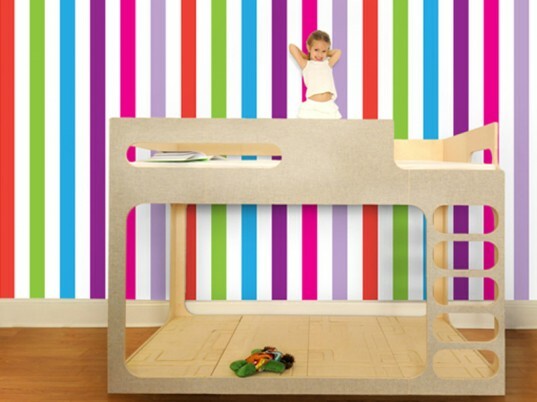 Pop & Lolli, long known for their deliciously colorful and safe wall decals, have just launched another design option for kids bedrooms, playrooms or the nursery: wallpaper! In fact, some of their new wallpaper options are so delightful, you may skip the kids rooms altogether and put this paper up in your living room or bathroom. With 10 design choices and tons of color options available, this is wallpaper made for every modern home. 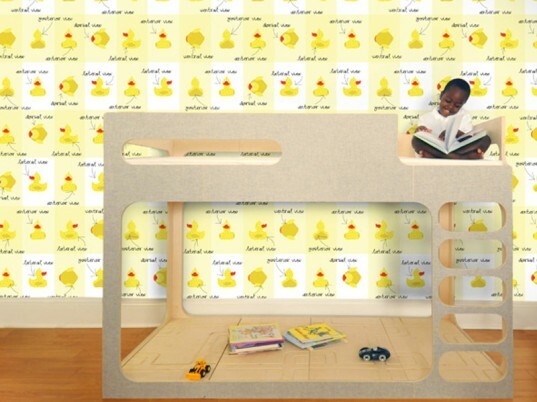 Keep reading to learn more about this wonderful new, non-toxic wallpaper. Just like their lovely wall decals, Pop & Lolli wallpaper is made with ultra premium, very re-usable, finely woven polyester fabric. This wallpaper is a refreshing change from typical toxic vinyl wallpaper which is normally packed with health concerns, such as lead, phthalates, cadmium, organotins and many other harmful and toxic ingredients. 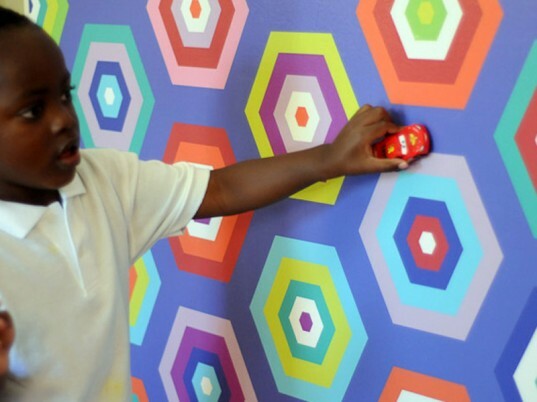 This wallpaper is easily installed without glue too, which eliminates any toxic adhesive issues. 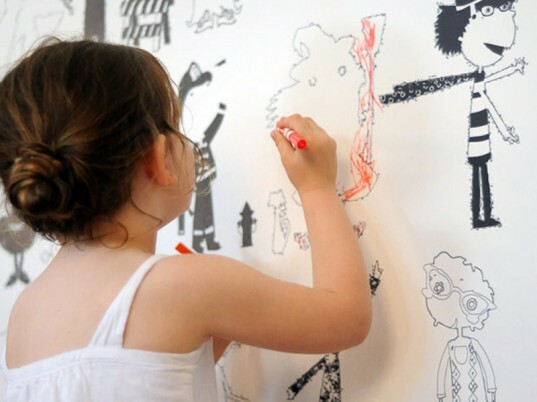 Pop & Lolli wallpaper is designed for ease of use. You don’t even need professional installers — just a willing friend to help you out. You simply trim the sheets’ backing paper to the edges of the wallpaper or cut your paper to the size and width required upon pre-measuring your wall. Then, hold your wallpaper in place with the backing paper still attached. Starting at the top of the wall, peel the backing paper away, while smoothing down the wallpaper. If you get stuck with some wallpaper air bubbles, you can simply use a tiny needle or pin tack and prick it gently to make a tiny hole, then smooth the bubble out with your thumb. Easy as wallpaper pie – good news for busy parents. The new Pop & Lolli wallpaper collection comes in 10 distinct varieties, which means you’re sure to find the perfect paper to fit your needs. Designs range from fun to cute to sophisticated and are available in various color schemes. For example, Hello Conversations, shown above is available in the black you see above or with a background of aqua, magenta, purple or green. Check out each design to see which colors are available in each. 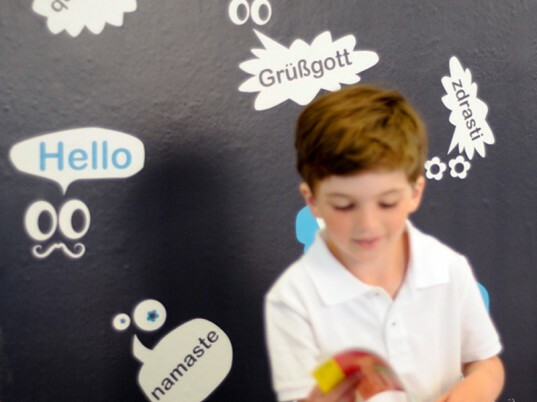 Pop & Lolli chic fabric wall stickers and wallpaper are proven to stick to almost all surfaces including more roughly textured surfaces. This in mind, Pop & Lolli wallpaper can be placed in any room of the house, including the bedroom, living room, kitchen, playroom and even the bathroom. In fact, this stick to most surfaces wallpaper can even be placed on the ceiling for an ultimate colorful room experience. Got artistic kiddos? Or maybe just kids who can’t keep their eco-friendly crayons off the wall? Try Pop & Lolli’s hyper fun coloring wallpaper. Kids will love this fun to color paper and can change up the colors when the mood hits. The other Pop & Lolli wallpapers are suitable for coloring as well. Beyond wallpaper safety and ease of use, this is an eco-friendly wallpaper choice. Pop & Lolli have many eco-initiatives in place, such as zero paper receipts, no paper instruction booklets or product inserts and are a cruelty-free company too. Plus, when you order from Pop & Lolli, the company uses some of those funds to help provide educational materials and resources for a South African child in need. Ordering from Pop & Lolli is a breeze due to their easy to manage online shop. This paper comes in a roll that’s 52″ wide and 8′ (96″) inches in height, so be sure to measure your walls before ordering. Love the wallpaper! But also that bunkbed/loft! Do you know where that's from? Thanks! Pop & Lolli wallpaper is designed for ease of use. You don't even need professional installers -- just a willing friend to help you out. You simply trim the sheets' backing paper to the edges of the wallpaper or cut your paper to the size and width required upon pre-measuring your wall. Then, hold your wallpaper in place with the backing paper still attached. Starting at the top of the wall, peel the backing paper away, while smoothing down the wallpaper. If you get stuck with some wallpaper air bubbles, you can simply use a tiny needle or pin tack and prick it gently to make a tiny hole, then smooth the bubble out with your thumb. Easy as wallpaper pie - good news for busy parents. The new Pop & Lolli wallpaper collection comes in 10 distinct varieties, which means you're sure to find the perfect paper to fit your needs. Designs range from fun to cute to sophisticated and are available in various color schemes. For example, Hello Conversations, shown above is available in the black you see above or with a background of aqua, magenta, purple or green. Check out each design to see which colors are available in each. Got artistic kiddos? Or maybe just kids who can't keep their eco-friendly crayons off the wall? Try Pop & Lolli's hyper fun coloring wallpaper. Kids will love this fun to color paper and can change up the colors when the mood hits. The other Pop & Lolli wallpapers are suitable for coloring as well. Beyond wallpaper safety and ease of use, this is an eco-friendly wallpaper choice. Pop & Lolli have many eco-initiatives in place, such as zero paper receipts, no paper instruction booklets or product inserts and are a cruelty-free company too. Plus, when you order from Pop & Lolli, the company uses some of those funds to help provide educational materials and resources for a South African child in need. Ordering from Pop & Lolli is a breeze due to their easy to manage online shop. This paper comes in a roll that's 52" wide and 8' (96") inches in height, so be sure to measure your walls before ordering.